South-east Iran has been hit by a 7.8-magnitude earthquake, with tremors felt across Pakistan, India and the Middle East. The US Geological Survey said the epicentre of the earthquake was 53 miles from the city of Khash, near the border with Pakistan. Offices were evacuated in Abu Dhabi and tall buildings swayed in the Indian capital Delhi, witnesses said. Iranian state TV has reported at least 40 people killed, although one official says he fears hundreds have died. This is the largest earthquake in Iran in the last 40 years. All communications have been cut and assessment teams are being sent to the stricken area, he says. The earthquake struck in the province of Sistan Baluchistan at around 3:14 p.m., close to the cities of Khash, with a population of nearly 180,000, and Saravan with 250,000. Iran’s Fars news agency was reporting that no serious damage had been reported in Saravan. The quake was felt in the cities of Karachi and Quetta. It comes a week after a 6.3-magnitude quake struck south-west Iran, near its nuclear power station. 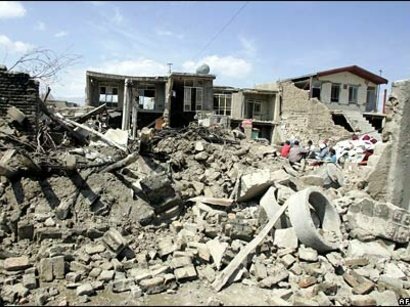 At least 37 people were killed and 850 wounded in the earthquake that struck near Bushehr on April 10.